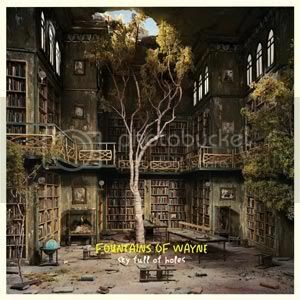 If you approach Fountains of Wayne’s 2011 release ‘Sky Full of Holes’ expecting to hear lots of similarly structured power pop as featured on those earlier discs you may be in for a surprise, since huge chunks of the album are devoted to the band’s more downbeat, less immediate qualities. And then the bouncy piano line which cuts through the heart of ‘Acela’ appears. Coupled with a very Beatles styled vocal, it would be tempting to call this McCartney-esque, but there’s something more to it than that. As the track progresses with some great interplay between the piano and a solid drum arrangement (courtesy of Brian Young), that other element soon becomes apparent: this has a feel which isn’t too far removed from Crowded House’s rockier moments – and that’s something which is often welcome. Everything’s nice and tight and although the song still doesn’t quite hit that “instant gratification” button, the band certainly sound more energized here. And when ‘Someone’s Gonna Break Your Heart’ follows, brimming with harmony vocals, a decent chorus and an occasional stabbing piano, there’s a feeling of a band hitting their stride. ‘A Dip In The Ocean’ is another upbeat piece of brilliance, allowing Young to showcase his hi-hat work which keeps things buoyant throughout. The guitars chime in a classic Big Star fashion and the gang vocals really give things a full sound. In short, this track is a piece of power pop genius. These three songs definitely make up for any shortcomings on those earlier numbers. Elsewhere, the album is understated and rather more mature in sound. ‘A Road Song’ reinstates those acoustics, but brings in a new element – in this case, a subtly used steel guitar. This acoustic sound, harmony vocals and a slight country air push Fountains of Wayne into a musical world somewhere between Jackson Browne, The Thorns and early Wilco. While it’s not especially likely you’ve bought a FOW album to experience Americana styles, the band sound relaxed and natural in this particular musical vein. So much so, they follow this up with the similar-ish sounding ‘Workingman’s Hands’ which keeps in the harmonies and acoustics, but eschews some of that steel guitar for a gently played slide and occasional piano flourish. ‘Hate to See You Like This’ makes no attempt at breaking any relatively downbeat vibes. A steady backbeat on the drums gives the number a brooding atmosphere, while acoustic and electric rhythm guitars punctuated by clanging piano chords provide the main tune. Vocally, the harmonies give things a lift, and eventually, this well-constructed number sounds not unlike something which could have been written by Scott Janovitz and his Boston outfit The Russians. Naturally, some of you will be approaching this album looking for a sing-along opportunity a la ‘Stacy’s Mom’ and if it’s only with ‘Radio Bar’ (track 11 of 13) that ‘Sky Full of Holes’ comes close to that. With the addition of a trumpet and glockenspiel, Fountains of Wayne launch into a tune that’s brazenly poppy. The verses are catchy enough, with the whole band sounding really tight, but it’s the chorus which hits. And it hits like brick. Combining a simple refrain of ‘whoah-oh-oh-oh!’ with a trumpet which recalls The Boo Radleys’ ‘Wake Up Boo!’, this song will stick in your head for weeks…and that’s a promise. The album winds down in a downbeat way with a semi-acoustic waltz (‘Firelight Waltz’) and ‘Cemetery Guns’, a number which combines acoustic guitars, strings and military drum-rolls. Neither track is as good as either ‘Road Song’ or ‘Workingman’s Hands’ – and as such isn’t likely to get you too excited – but even so the arranging is spot-on. ‘Sky Full of Holes’ isn’t as easy to get into as ‘Traffic and Weather’, but that’s not to say it’s inferior in the main; it’s just a bit…different. Fountains of Wayne’s fifth studio album often has more of a singer-songwriter style than the full-on power pop which filled more of their previous outings. No matter what the style, though, it’s hard to find fault with most of the arrangements. Hopefully, this slight shift in musical approach will go some way to shaking off those Weezer comparisons Fountains of Wayne often get lumbered with. And quite frankly, even during its weaker moments, this album features material that is far better written (and arranged) than almost anything Rivers Cuomo is likely to commit to plastic ever again. Ever.